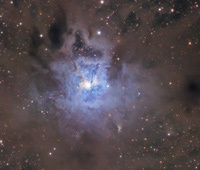 The Iris Nebula (NGC7023) is a reflection nebula (mag 7 at its brightest) 1300 lightyears away. NGC7023 actually refers to the star cluster within the nebula whereas the correct designation of the nebula is LBN 487. The discovery by Sir William Herschel dates back to 1794. The centeral part of the nebula surrounds a young massiv star. Some filaments (see crop version beside) around this star glow in a reddish color due to some dust grains that effectively convert the star's invisible ultraviolet radiation to visible red light [APOD, 2004]. These branches of the central nebula might contain complex carbon molecules known as PHAs (= Polycyclic Aromatic Hydrocarbons), suggested by infrared observations. However, the dominant color of the central reflection nebula is blue - as expected from dust particles reflecting the starlight. 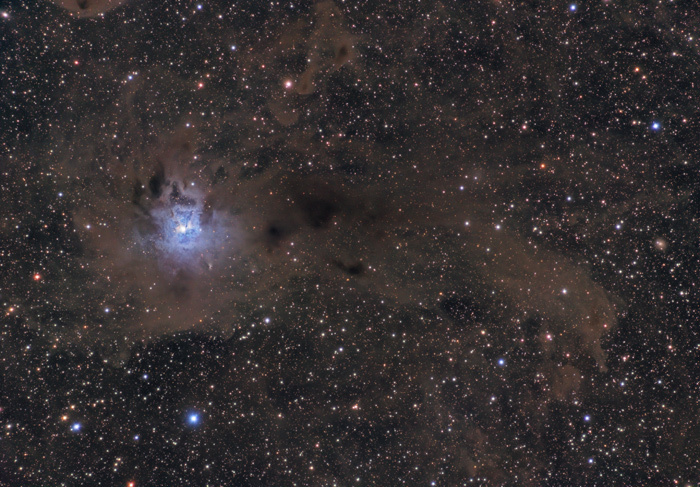 Other, dark parts of the cold molecular cloud reveal great and obscuring structures.